Fight Poverty: It’s Blog Action Day today! It is today, it is now, it is blog action day. Once again thousands of bloggers unite to deliver an important message. The numbers above are rising fast, meaning that this is working. My message is very simple: We can end poverty. Not tomorrow, not next year, but right now. I need comments on this post! I know that you can share something good, and I did and still doing my part by being active socially, Online and offline. One group that I promote (And proudly THE TOP recruiter on the hall of fame on it) is the facebook cause called: “MicroPlace” which is a brilliant idea by non other than eBay founder (and his network) Pierre Omidyar. (Note: in order to be able to view the cause page on facebook you must have a facebook account and be signed in or try here). The idea of MicroPlace (Which also can be reached at www.Microplace.com) is very simple: People helping people. That’s it in a nutshell. People generally like to invest money. Why not micro invest their money to help families around the world to start a small business? This way they helped them out of poverty, provided an honest work environment, shared the love, and also shared the profit. But then again it’s not always about profit, it’s about how good you will feel after helping someone. If you watch Oprah, you will understand her point of helping people without expecting anything in return but the joy knowing what she did was a great thing. My point of showing you the facebook cause/group is to show you that I have been doing it for a long time now, almost on a daily basis, and I beleive that if everyone who is reading this right now start by just spreading the word about MicroPlace (everyday, not just today! ), I beleive that we can put an end to poverty very soon. Another thing that I will do, is to buy 25 dinner boxes and tweet about my location where I will be giving it out in New York city tonight, feel free to come and help out, I will be posting tweets on my Twitter page here of what’s happening. I wish you could all awake and see what’s happening around us!! Hope TODAY people will se clearly… and ACT!!! WE CAN ALL MAKE THE DIFFERENCE!!! cool. great to see that you’re truly enthusiastic about this. best of luck to you. Thanks for stopping by my blog and posting comments. I like your suggestion that we must stop poverty now – not tomorrow – or the next day. We do have the means to accomplish it, so what is stopping us? Hi! thanks for commenting on our site! Wow, great job here with your efforts! i applaud you! I myself do clickable donations and donate monthly to March of Dimes and the childrens hospital here in Phila. Thanks for stopping by and saying hi, this important day is about spreading the word and hearing all the voices shouting to the roof tops that we can stop poverty! I’m a teacher in Mexico and the best thing I can do is continue to raise awareness with my students about what is going on around them every single day, and to show them that there are ways to put a halt to the horrific conditions in which so many Mexicans live. I encourage them to volunteer and to get involved with their community. There’s not much that they can do to help financially, no one here has a whole lot of money, but even a bag of rice or a kilo of tortillas to the family down the street can be a huge help. great post – I agree, micro-financing is the way to go. I love your idea of going around New York with dinner boxes! Thanks for stopping by Alex, and thanks x 10 for the information about MicroPlace! The rather vague theme of my Blog Action Day post was that poverty eradication is achievable and sustainable if it is a collective, communal effort. I think we bloggers are proving just that today and it is up to the all of us to keep making the continued effort. As elena said in an earlier comment “We can all make the difference”. What a great post! I’m with you on people helping people. I’m a big believer in teaching people to fish rather than giving them a fish. I’m definitely going to check out the links. Thanks for providing them! Nice post Alex, you’re definitely getting involved and that’s great. I also love the theme of your blog… Revolution? I knew it looked familiar! For some that is giving money, for others that is giving time, for bloggers in might be creating awareness for this critical issue. This is truly a great cause and it’s great to see so many blog participating. 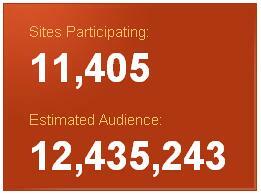 It just goes to show the power of bloggers and of Internet marketing when we unite. This is a great post, I love your enthusiasm to take action! It’s great to see the response around the world of Blog Action Day and to see so many blogs posting great ideas about how to take action. Being in Cameroon, I feel somewhat disconnected from the world in being sometimes compared to how connected I was back in the states, but today I started to feel that “global village” atmosphere again seeing everyone joining forces to promote awareness and help fight poverty. Ah I wish I were in NYC now to come along. Too bad. I’ll just do my share from London then. I love Blog Action Day and hope that many people will get inspired to make a difference. Thanks, for stopping by our blog and sharing with us what you’re doing–glad to see so many wonderful causes coming together around the blogosphere today! New Orleans CityBusiness’s blog is raising awareness about poverty today. Go to http://neworleanscitybusiness.wordpress.com/. I am a true believer in microfinance, and it can’t be worse than investing in our financial system at the moment! I applaud your call to keep the action going, long after Blog Action Day is over and done with – and your enthusiasm is surely infectious! Thanks for leaving a comment at my blog. I glad to see that you are helping to create something that will still be contributing tomorrow and beyond. The idea behind MicorPlace is important if we are going to move this effort to a new organizational level. We can’t just depend upon governments. yeah, we all need to do our part in ending poverty. this is an everyday thing we need to be doing. it starts today! I am so excited to see all the different ways people are contributing to Blog Action Day. I posted about poverty and education today. I think the ideas you mentioned here are great, and it is wonderful you are going to be handing out dinner boxes tonight! Blog action day is such a wonderful way to do a small part in ending poverty. I have also done a post for a project I am supporting….be sure to take a look! Thanks for checking out my blog post and leaving a comment. Love you’re plan for tonight. You are going to light up a few lives, even momentarily. NYC has a surprising number of angels…. Very cool post! It’s great to see how people are getting into Blog Action Day. Honestly, it’s such an encouragement to see all sorts of people who care each doing their part, and ultimately ending up working together. If we all make up our minds we can make poverty history! Thank you for leaving the comment on my blog. As most of the comments stated, I believe that it is necessary that everyone joins together, with Blog Action Day as the first step in the fight to end poverty, or any other issue. Even if you, yourself are facing a hard time, remember that there are millions upon millions of other people who have it worse than you – these are the people that need help. The very smallest of donations (support, help, or microfinancing, as prime examples) are crucial in preventing issues like poverty from existing. I’m glad to see how everyone has banded together to do their part. every individual has an impact on society, the issue is whether we will accept the responsibility and acknowledge that we can work towards improvement. of the main issues facing the world – education, poverty, security – poverty is where the average person can truly make a difference. show your concern, share your passion with friends, family and co-workers, donate to your local food pantry and make any financial donation to worthy international groups. attack the problem at both points!! thanks. If you’re interested, you should check out this cool China-oriented microfinance intermediary called Wokai.org. They’re launching their new online lending platform this November, and you’ll be able to donate money to Chinese entrepreneurs to help them create a self-sustaining business and lift themselves out of poverty. Wow, you are very involved, that’s really cool. I am just awakening to it, I knew of it just didn’t really know where to look to help, you gave some good examples. Thank you for all you do. Thank you for your encouragement to others to find ways to share what they have with those who are less fortunate. Also, thanks for pointing out Microplace.com. My wife and I are always looking for ways to share with others. I also wrote a post about Blog Action Day on our GrandparentsTLC.com blog and my personal blog as well. Great work in raising awareness and donating! I agree – microfinancing is definitely the way to go to help poor people empower themselves to sufficiency!! I live in a community that is poor – in a relative way to the surrounding area and the rest of New Zealand. I am looking at setting up some sort of similar local scheme to help stimulate our local economy and provide options and opportunities for people in our community. Anyone with advice, experience, enthusiasm – or a large amount of spare cash 😉 – that wants to support this can contact me via my blog . . . The fight against poverty is our all responsibility but unfortunately we draw artificial barrier between the have and the have nots.“This limited view on its own national borders, frees one from looking at the misery of the world.” Ulrich Beck. Nice post, and the idea of the boxes is great. Good luck with your pursuits! Excellent post and thank you so much for your comment on my blog. I have been really impressed by the impact that blog action day is having across the blogosphere. You hit it just right. Poverty cannot be solved by just giving money to them. These people need to be educated on how to help themselves. I should know. I’ve been there. If not for the people who trusted me and gave me a chance, I am pretty sure that I cannot escape from being sucked by poverty.. I truly believe that each of us should treat each other as members of one big family. I did not donate money, but I hope my testimony will serve as inspiration that poverty can still be cured. You’re doing great work here. I love the connected nature of this whole event, not just that each blog exposes its readers to these thoughts but additionally that blog creators are getting involved in otherwise unrelated fields. I completely agree about microfinancing, and commend your idea about schlepping around town with food. I’ll be following your twitter! Hello! Thanks for reading our blog post about poverty! Thanks for visiting my blog. I honestly think to end poverty, we all need to stop thinking we give what we can, admit we don’t give or do enough and simply do it! Spend time helping others each and every day, give money, provide loans, volunteer, help those near and far. We need to see that with people there are no borders. It is about humanity. All of the various web-based ways of fighting poverty (Kiva, social stuff, etc.) are very interesting. Though most people use the web for work and fun, I think there could be a real potential for the web to help organize efforts to combat poverty. It’s really great to see that there are still people who have their own way to make a difference this world. I think each one of us should have a foundation to support. Sharing a bit of our income wouldn’t hurt. Give a little love and it all comes back to you. It might be little but together, we can make a big difference. Great job! Your strategy of visiting other people’s blogs and writing comments has obviously paid off in how many people have returned the favor. That is a great networking strategy which I also try to incorporate in what I do. I also posted a blog article yesterday, pointing out some of the same things you’ve said. We need to keep doing this every day so we reach more people, encourage those who are involved, and engage those who are not yet involved. However, I also showed how maps can be used to point people to places where poverty is most concentrated and to organizations doing work in these different places. Without the map to guide our actions, it’s likely that highly visiblie organizations or places will get the most attention, and other places with great needs will get limited, or inconsistent attention. With the map we can encourage a better distribution of resources and programs, and help to connect programs in the same area with each other. Excellent effort guru. It’s great to see such a dedicated effort to get others involved. And very creative use of twitter too! We’ll be posting about the progress as well. Thanks for the visit and good luck! Microlending is a brilliant and studies are showing they are no more risky than traditional loans. It’s a real way to effect change. It’s great to see blogs talking about it. I love the idea of people helping people to help themselves (of course, don’t get me wrong – I also love the idea of people simply doing what they can at the time – giving a dollar, handing out a sandwich, volunteering at a “soup kitchen,” etc.) There are immediate, “band aid” fixes, and there are more involved, permanent fixes. I believe both kinds work well together to help end poverty. Good idea. Getting people to talk and show support is key. Great cause and execution. Keep up the work and thanks for stopping by our blog.